Are the Grizzlies going to trade Zach Randolph? 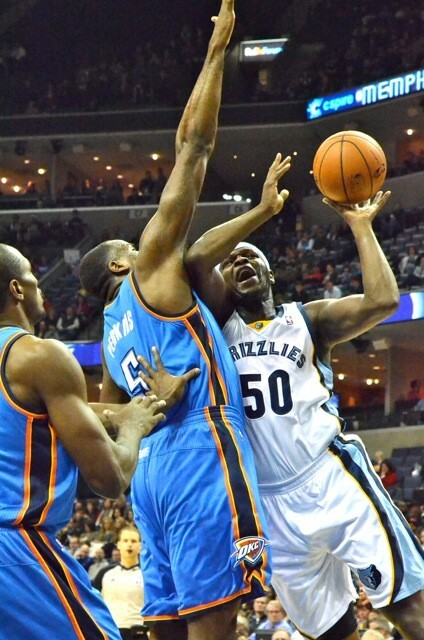 Uncertainty about Grizzlies forward Zach Randolph is starting to creep in around the edges. The rumor mill is starting in earnest now, with yesterday's Bleacher Report story on a rumor that the Grizzlies and Pelicans were discussing a trade of Zach Randolph for young sharp-shooting forward Ryan Anderson. While not likely to happen (according to Chris Vernon, anyway), the fact that another actual rumor has been reported is another sign that the Zach Randolph Rumor Mill is starting to get going. With the Grizzlies struggling to get anything accomplished while missing four players due to injury, two of them (Marc Gasol and Quincy Pondexter) for extended stretches of time, and Zach Randolph approaching a $16.5 million player option for next year, it was bound to be this way. Here are three reasons the Grizzlies should trade Zach Randolph, countered with three reasons they shouldn't. Randolph is aging, and while his production hasn't dropped off the way some feared it would, the Grizzlies also owe Marc Gasol $15.8 million next year (the final year of his current contract), they owe $8.7 million to Mike Conley, $7.7 million to Tayshaun Prince, $5 million to Tony Allen, and other deals for Quincy Pondexter, a team option for Kosta Koufos, and Jon Leuer and Jamaal Franklin on sub-$1 million deals. Ed Davis becomes a restricted free agent at the end of this season. So... the Grizzlies don't want to fill up $16.5 million of next year's salary with Zach Randolph—they have to either work out a longer-term deal for a lower yearly salary with Randolph, or trade him now before he can pick up the player option. This is a team that desperately needs to add talent at the wings going forward. The Conley/Gasol/Randolph trio are going to continue to get beaten by teams that clog the paint until the Grizzlies acquire a credible wing threat or two to pull defenders away from the rim and keep them honest: that's a fact. If Zach Randolph is making $16.5 million dollars for the Grizzlies next year, it severely limits the free agents they can sign, and it means that those wing players they would presumably acquire will have to learn to play in the Grizzlies' current plodding, violent style. With Randolph off the books, swapped for a young power forward and/or a young wing player who can make threes, defend at a high level, and create off the dribble when the need arises (basically, who can be what Rudy Gay could have been if he hadn't become a first class 19-foot Brick Machine), the Grizzlies can continue to build their offense around Mike Conley and Marc Gasol and contend more effectively against teams like the Spurs, who are going to keep beating this team until they can hit an outside shot. The Grizzlies are not going to be able to get a player worth that much in exchange for Zach Randolph in a trade, and here's why: Randolph might be willing to take a longer-term deal for a lower annual salary in Memphis, but if he gets traded to Milwaukee or somewhere else he's not excited about being, he'll pick up that $16.5 million option for next year faster than he can get Blake Griffin on the floor in a Scorpion Deathlock. That limits what teams are going to be willing to give up for him, value-wise. Randolph is also unlikely to entice a team drafting in the top six or seven in this year's draft to give up a pick—and that's the kind of a player the Grizzlies would presumably want in return. What I'm saying that any move the Grizzlies are able to make with Randolph during the year is likely to be a salary-dump type move that just... gets him out of here in return for a bunch of spare parts and bad (but not "as bad" as a $16.5 million option) contracts. It's not going to make the Grizzlies any better this year or next, but rather just frees up some space for the Griz to potentially sign a free agent. The return on a Zach Randolph trade means it's probably only a net positive if it happens after Randolph picks up that option and becomes a $16.5 million expiring contract, rather than before when there's still time to work out a longer/cheaper deal. Z-Bo isn't getting any younger. He's 32 now, and while he's been a dominating force inside for most of his career (when appropriately motivated, which was rare before his time in Memphis) as the years go by Randolph becomes more and more floor-bound, and his rainbow 17-foot jumpers start getting blocked more and more often. He's always struggled with longer, taller defenders—an extreme example of which is playing out right now with Gasol out, as every team the Grizzlies play are able to guard him with the tallest guy they have—but as he ages he seems to have more and more trouble against players like DeAndre Jordan, Serge Ibaka, and even—and I wouldn't have believed this until it happened earlier this season—Jared Sullinger. He's shifted from a "garbage man" role in 2009-2010 to the primary feature of the offense in 2011 and back to more of a garbage man now, but he still uses a lot of possessions and a great deal of time is spent by Grizzlies guards trying to feed the ball into the post for Randolph whether he's got his shot falling or not. He's been injured for multi-week stretches in the last two seasons (a knee injury in 2012, and a two-week ankle injury in 2013) and has come back less than healthy to try to lead the team into the playoffs at less than full strength. He may be reaching a point where age is hampering his production as an offensive threat. 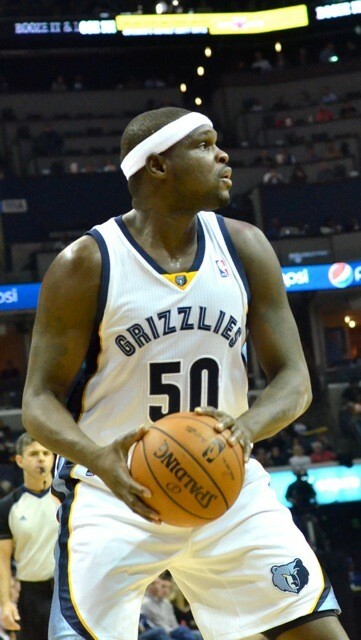 Has there ever been a better garbage man in recent memory than Zach Randolph? As his limited jumping ability leaves him, surely his touch around the rim and his knack for knowing where the rebound is going to go (as well as his ample posterior for moving other folks out of his way) will stay, and he'll be able to camp out under the rim and clean up. If Randolph is willing to recognize that his role needs to change over the years—to the point that maybe in three years' time he has to come off the bench (which, let's be honest, I'll believe when I see) if that's what the team needs from him—he can be a valuable asset well into the future even as his skills start to fade. This isn't so much a reason why Zach Randolph should be traded, so much as it is a reason the Grizzlies should make such a deal if one were to come along: the Grizzlies' front office cares about (or should care about) only two things, ultimately: the financial healthy and viability of the franchise, and whether that franchise can win the NBA Finals. And, yes, in that order. If a trade comes along that the Grizzlies can make that will make the team better immediately—as in the rest of this season or next year—and that saves the team money to spend on other free agents to get better, they should do it. Zach Randolph is one of the most beloved players in Memphis Grizzlies history, but ultimately, fans are fans of the Memphis Grizzlies, and if the team is better, fans should be happy—happy that the team is better, even if understandably sad that Z-Bo must be dealt to make that happen. At the end of the day, all of these guys are only on the team for a limited amount of time. None of them will be here in twenty years, but hopefully the team will still be here long after that. Fans, even though they grow attached to players they love, ultimately care about winning. If the team wins with Zach Randolph, all for the better. But if the team wins without him, fans will still come. If the team keeps Zach Randolph to placate fan sympathies and ends up becoming a worse basketball team because of it, those fans aren't going to come anyway. Look at the games now—the Grizzlies didn't sell out a game against the Thunder because they're hurt and not winning. Ultimately, the franchise has to do what's going to win games and enable the franchise to keep winning games in the long run, even if that means making painful decisions in the short term. There have been "Grizzlies fan favorites" before, but there's never been a Zach Randolph. The second the Grizzlies beat the Spurs in that first playoff game, his legend was cemented, and his bullying, "we don't bluff" toughness and "blue collar player from a blue collar town" quote resonated (and still resonate) with this city in a way no other professional athlete ever has—or could. No one wanted Zach Randolph, just as Memphis often feels no one wants us. Together we've done great things while mostly overlooking each others' flaws. Zach Randolph is the Memphis Grizzlies to a lot of people. The Grizzlies front office since the beginning of the Pera/Levien/Lash/Hollinger era has made moves that were unpopular with "casual fans" and NBA analysts (mostly on ESPN) that turned out to be the right moves: the Rudy Gay trade, the salary dump trade with Cleveland before that that made it possible (and netted Jon Leuer, although that first round pick would be nice to have back). The trade of Darrell Arthur for Kosta Koufos, the drafting of Jamaal Franklin (who appears to be a legitimate NBA player even if he's only playing right now because there are so many injuries). The problem is that they've never had good control of their messaging. They've never come out and said "here's what we're doing and here's why we think we need to do it." They've never said much of anything at all. As a result, fans who aren't close NBA observers think they just traded away a great player they need (Rudy Gay) and fired a coach who was the greatest thing since sliced bread (Lionel Hollins) just because they're (1) cheap or (2) incapable of dealing with people who will tell them no. Whether or not it's the truth (and I happen to think it isn't) they've done a poor job of selling their plan for the team to the wider fanbase, and as a result there's portion of the fanbase that feels alienated from the team, like the team doesn't care what the fans think. If the Grizzlies trade Zach Randolph now, it will be years before a large portion of Grizzlies fans forgives them. It will look like yet another one of these moves they're making to be cheap (even if it's (1) not cheap and (2) the right basketball move to make), and they'll have to deal with the charge that they've destroyed everything that was ever good about the franchise, fairly or not. Trading away the player who essentially put professional basketball in Memphis on the map when there are ways to make it work and keep him is a risky move for a group that has done a poor job making fans feel like they know what they're doing, even when they do. Yeah, but are the Grizzlies going to trade Zach Randolph? All that is to say: it's complicated. Before the season, I said there wasn't any way to know whether Randolph would be on the team at the end of the year. A quarter of the way through, I still think it's a toss-up. I think the Grizzlies are going to struggle to get the kind of player that they want in return for Randolph—according to Chris Vernon and a couple of other sources, a "big time athlete" power forward they can slot next to Gasol—and still be able to bolster the wing rotation. But I also think that there are teams that want Randolph, and teams that are poorly-managed who might give up the kind of player the Grizzlies want in return, and I think that if that move presents itself—if a move that makes the team better presents itself, I mean—I think the Grizzlies will take it. The bigger question to me is this: will they be able to convince the average NBA fan that they know what they're doing if they do make such a deal, and what effect will it have on Grizzlies basketball in Memphis going forward? Will all of these new fans, drawn to the team by the Grit and Grind era, stick around as it changes into something else before they're ready for it to? It's a serious question. Beyond that, I think there are ways to make the money work and keep him around that are beneficial from a basketball standpoint. If the Grizzlies and Randolph come to an agreement for a longer-term deal for a much lower annual salary (the figure that comes to mind is $30mil/3yrs, but that's just a guess) and he doesn't pick up his player option for 2014-15, and if he is able to keep playing at a high level for the rest of this season even with Gasol out (which he has so far, other than struggling mightily against defenders he'd never have to face if Gasol were on the floor), it's probably in the best interests of all parties involved to keep him around. As of right now, my unsourced, gut opinion is that I think it's 60% he'll stay, 40% he'll be traded, but either way, the arguments are there on both sides.